A detective leading the investigation into the murder of RUC officer Michael Ferguson in Londonderry’s city centre 26 years ago has issued a fresh appeal for witnesses to come forward. Detective Inspector Conor Sweeney from the PSNI’s Legacy Investigation Branch confirmed that the investigation into the 1993 killing is being revisited as a result of techniques and tests available today that were not available at the time, including, but not limited to, forensics, and that they were “close” to bringing those responsible to justice. At a press conference on Saturday afternoon, Det. Insp. Sweeney also made a direct appeal to the gunman behind the killing to examine his conscience and come forward. He also said he believed there were people in Londonderry who had information about the killing of the Catholic police officer outside the Richmond Centre on Saturday, January 23, 1993. Michael Ferguson from Omagh, County Tyrone, was shot twice in the head at point blank range by an IRA gunman outside the Richmond Centre in Shipquay Street. Along with two other officers, he had been tasked to a report of shoplifting at one of the stores inside the centre. Speaking at Strand Road PSNI Station on Saturday afternoon, Det. Insp. Sweeney said: “Legacy Investigation Branch are appealing anew for information in relation to the murder of Constable Michael Ferguson almost 26 years ago. “Michael was shot dead in Shipquay Street in the city at about 2pm. Michael and two colleagues had responded to a reported theft from a shop within Richmond Centre. Michael had remained outside in the street providing protection to his two colleagues while they entered to deal with the call for assistance. “A lone gunman approached Michael from behind and shot him, at point blank range, in the back of the head twice. “The gunman made off on foot across Shipquay Street before entering Castle Street and he was last seen running in the direction of the Bogside. Det. Insp. 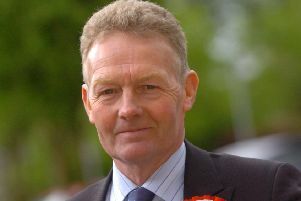 Sweeney said Legacy Investigation Branch were following a number of definite lines of inquiry. “I believe we are close to bringing criminal justice action against those responsible,” he said. “I’m here today to appeal to the local people of Derry, especially those who were on Shipquay Street at the time of the murder. The gunman did not have his face covered, and was wearing a distinctive green jacket with the word ‘gasoline’ printed on the back. “I believe there are people within Derry who witnessed this murder. I believe there are people who know the identity of the gunman. “Michael was a 21-year-old single man from Omagh with his while life ahead of him. Det. Insp. Sweeney said circumstances within Northern Ireland have changed since the murder as he made a direct appeal to Michael’s killer and to local people who may have information. “Allegiances may have changed,” he said. “There may be people who did feel able to speak out at the time who now feel able to do so. “I appeal to anyone who has information about this murder to search their conscience and please come forward with that information to the police. If anyone feels able to speak to us, we are ready to listen to them. “I would also like to take this opportunity today to appeal directly to those responsible for Michael’s murder. I would ask them also to search their conscience. A lot of time has elapsed since then but I would appeal to them to do the right thing and come forward to police. “It would mean a huge amount to Michael’s family. It would also mean that you would not have to spend the rest of your life looking over your shoulder and wondering when police are going to knock on your door. He added; “Despite the significant time that has elapsed, I remain confident that with the help of the community we can bring those responsible to justice.